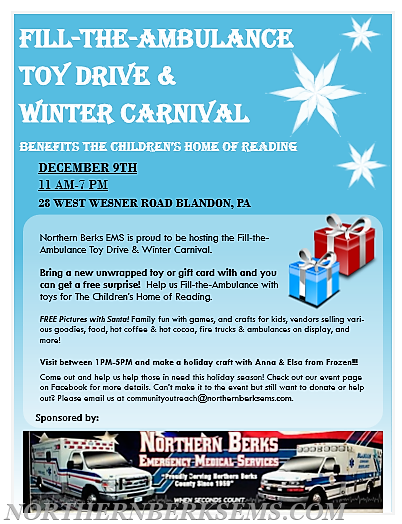 Northern Berks EMS is hosting our annual Fill-the-Ambulance Toy Drive & Winter Carnival to benefit The Children's Home of Reading. Come out to this event with a new unwrapped toy donation to help us Fill-the-Ambulance and get a FREE surprise from us! Free Pictures with Santa just bring your cell phone! Family fun with games, crafts for kids, vendors selling various goodies, food, hot coffee & hot cocoa, fire trucks & ambulances on display, and more! Visit between 1PM-5PM and make a holiday craft with Anna & Elsa from Frozen!!! Come out and help us help those in need this holiday season! Check out our event page on Facebookhttps://www.facebook.com/events/474855519552857/?acontext=%7B%22action_history%22%3A%22[%7B%5C%22surface%5C%22%3A%5C%22page%5C%22%2C%5C%22mechanism%5C%22%3A%5C%22page_upcoming_events_card%5C%22%2C%5C%22extra_data%5C%22%3A%7D]%22%2C%22has_source%22%3Atrue%7D for more details. Can't make it to the event but still want to donate or help out? Please email us at communityoutreach@northernberkems.com.